The Nestle Fibersource HN Rth Liquid 1500ml, Model #18522000, is anchored in advanced science and research. Nestle Healthcare Nutrition offers nutritional solutions for people with specific dietary needs related to illness, disease states or the special challenges of different life stages. The Nestle Fibersource HN Rth Liquid 1500ml provides concentrated nutrition with 1.2 calories / mL. Blend of soluble and insoluble fiber provides 100% of the RDI in 1400 Calories. NutriSheild provides a level of microbial protection. 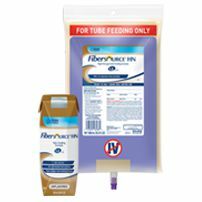 Suggested for those with elevated protein requirements or abnormal bowel function; or for extended inactivity or long-term tube feeding.